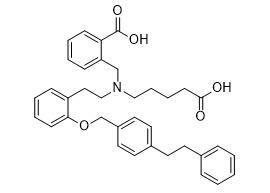 Remarks:Cinaciguat, also known as BAY582667 or BAY58-2667, is a soluble guanylate cyclase activator. Cinaciguat prevents cardiac dysfunction in a rat model of type-1 diabetes mellitus. Cinaciguat exert no direct effects on contractility and relaxation of cardiac myocytes from normal rats. Cinaciguat prevents neointima formation after arterial injury by decreasing vascular smooth muscle cell migration and proliferation.